He/she only “talks” a good ride. This came from a book I read as a teen. In the story, there’s a girl who boasts what a great rider she is—until she is actually seen riding and it turns out, she’s not so good after all. Don’t over-face a green horse. “Green horse” refers to a horse that is untrained or mildly trained. When you are training a young horse, there are times you know in your gut that they aren’t quite ready for something you ask them to do, a higher jump, perhaps. Over-facing always turns out badly. A young horse loses confidence and the training regimen usually regresses and trust is lost. The better you are, the less obvious your skills. Ever watch Olympic dressage? 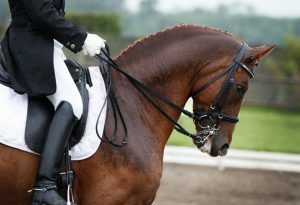 Dressage is the highest form of the equestrian arts. The rider’s movements are barely perceptible, but the horse and rider are in perfect step. Don’t overwork. A horse in training can get stale and bored if they don’t get time to relax, take a run in the pasture and just be a horse. Say thank you. A rider can thank a horse in many ways. An apple or pat on the neck may be the first thing that comes to mind, but, more significant is to relax the reins, giving the horse his head, and the freedom to do his own thing for a stretch. Probably the most important lessons of all are what I dub the three levels of learning. There’s the beginner or novice rider who knows they know nothing. They are eager to improve. Then there’s a middle stage, which can range from an intermediate rider to one who is quite expert in many ways. Many in this group often feel they have reached the highest level of learning and think they know everything. In any sport, art, or profession, this is where most find themselves. Then, there are true masters. A true master reverts back to the first level, continuing to train, honing their craft, knowing there is so much more to learn. Thanks Helen. This one of the best blogs posts I have ever read!